Find Ilikai Hotel & Luxury Suites deals, discounts and special offers. This oceanfront hotel offers ocean-view rooms and two-bedroom suites. Located in the heart of Waikiki, just a short walk from white sand beaches and Diamond Head Crater. Comfortable island hotel features swimming pool, casual dining and is near area beaches. Designed with island decor, hotel offers three restaurants, pool and on-site salon. 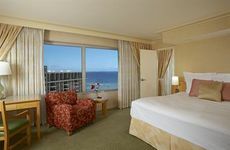 One block from Waikiki Beach, this all-suites resort features a heated swimming pool, lighted tennis court, and sauna. A boutique hotel with 3,000 square feet of meeting space, a heated outdoor pool, a fitness center and wireless internet. Beachfront resort boasts comfortable accommodations, two on-site restaurants and an art gallery. Oceanfront hotel features 226 guest rooms, roof top swimming pool and two on-site restaurants. Offering five unique towers, this Waikiki resort features a full service spa, six swimming pools and a saltwater lagoon. Located one block from Waikiki Beach, this boutique hotel features a continental breakfast and free polo tickets. Just three blocks from Waikiki Beach, this boutique hotel offers a continental breakfast, a spa and an outdoor pool. This Waikiki boutique hotel offers computer rental, free wifi in public areas, a continental breakfast and a spa. This boutique hotel offers a continental breakfast, fitness center, outdoor pool with stone sundeck and an on-site spa. This newly renovated boutique hotel features a deluxe continental breakfast, fitness room and free wifi access. Across the street from Waikiki Beach, this hotel features a continental breakfast and covered parking.